For this doll sized Mad Lib book, I printed the image found here. I printed the image on normal printing paper, then took a piece of card stock. I folded the card stock and glued the top edge of the image to the card stock. The front and back cover was finished! For the inside, I cut some white paper and folded it. I stacked the white paper and covers unfolded and folded in half to be sure the folds all matched up. I stapled it all together near the top ridge. 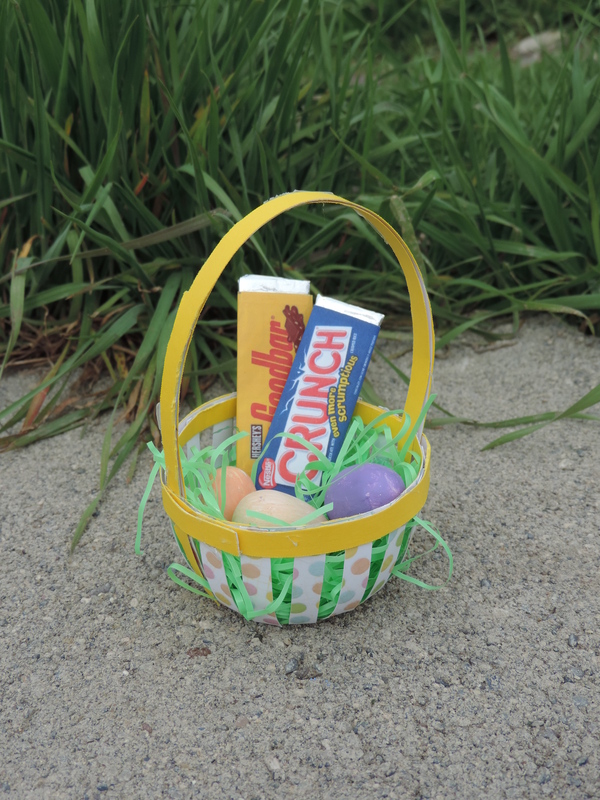 Every Easter basket needs a little bit of candy! 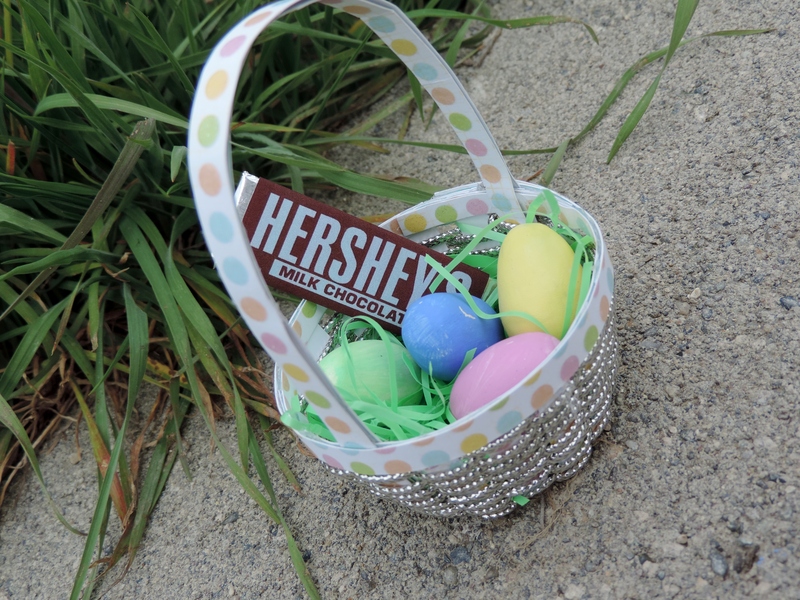 These doll candy bars are quick to make and very cute! 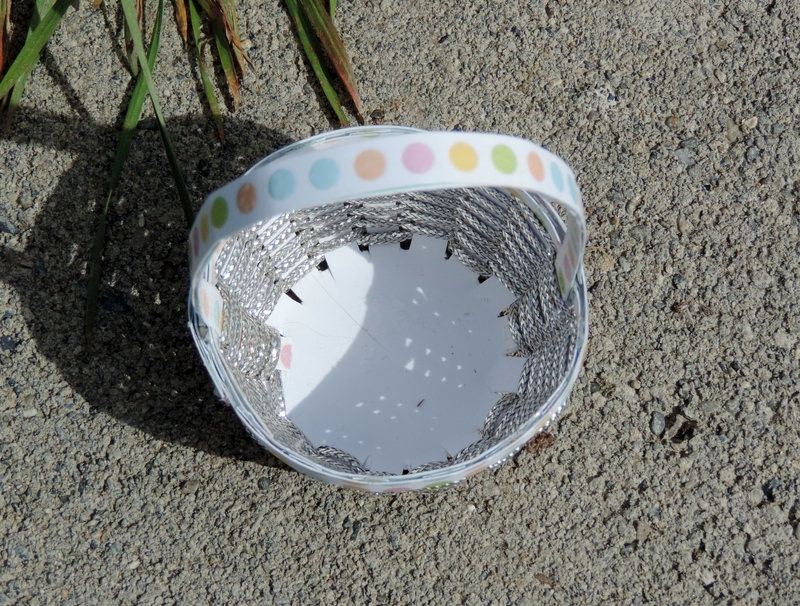 All you need is the template, a printer, craft foam, and foil! Find instructions and template here. 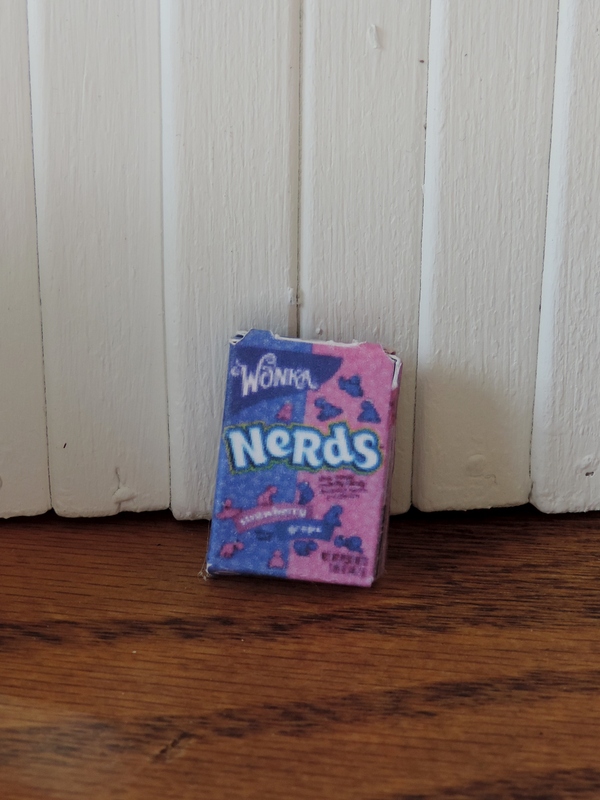 I also put together this printable of Nerds Candy. It is a little blurry. I put some seed beads inside the box before closing it to add weight and realistic sound when shaken. 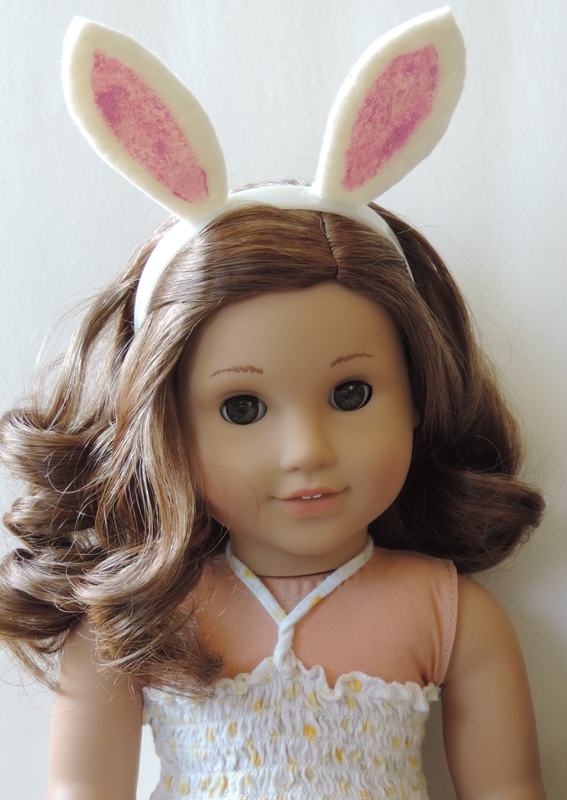 I made these two bunny ear headbands with felt, fabric paint, a blank doll headband. The blank headbands I purchased at Hairhardware.com here. I cut bunny ear shapes out of the felt and painted them with a bit of pink fabric paint. For the pair below, I used four ear shapes, two for each ear. I hot glued them together to make them more sturdy. For this one I used only two ear shapes, which makes the ears more floppy. 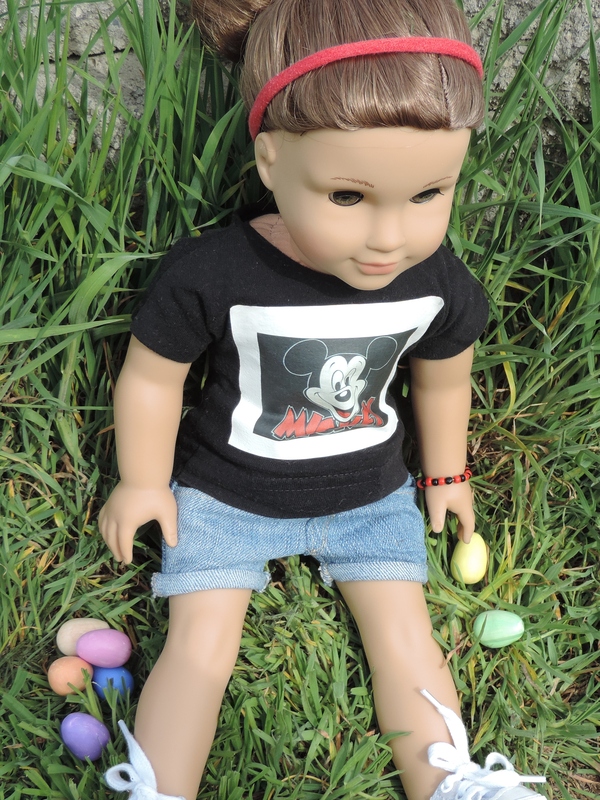 Modeling them is one of my Bitty Twins! I secured the ears to the headband with hot glue. To do this fun photo shoot, I had to build a table. At first I thought I would just use scrap booking paper and foam board to make the table. Luckily, I discovered some wood scraps from a house project! 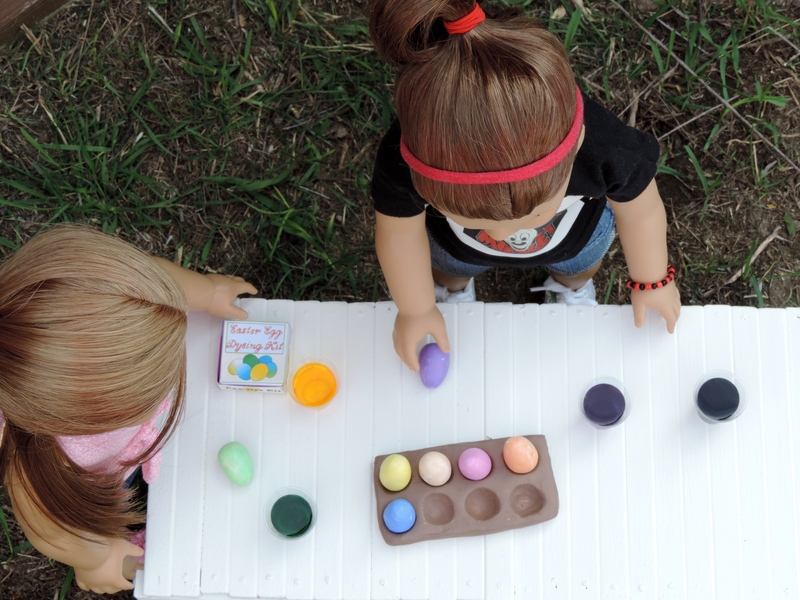 For basic measurements, I used this tutorial on a doll picnic table. Mine is a little smaller, at just about 17 inches long, 7 /2 inches wide and 8 inches tall. When I had finished putting it together, I painted it white. I am excited to use this table in more photo shoots! 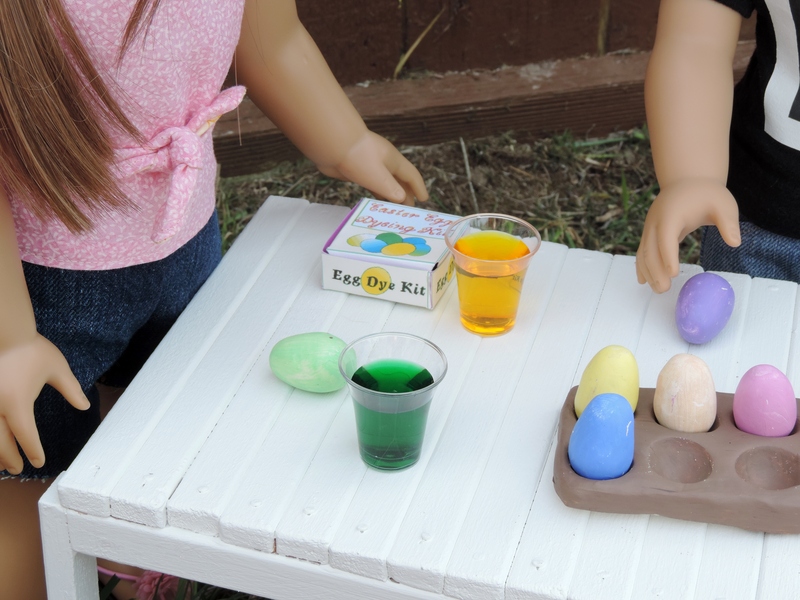 If your dolls want to color eggs too, here is the template for the Egg Dyeing Kit. 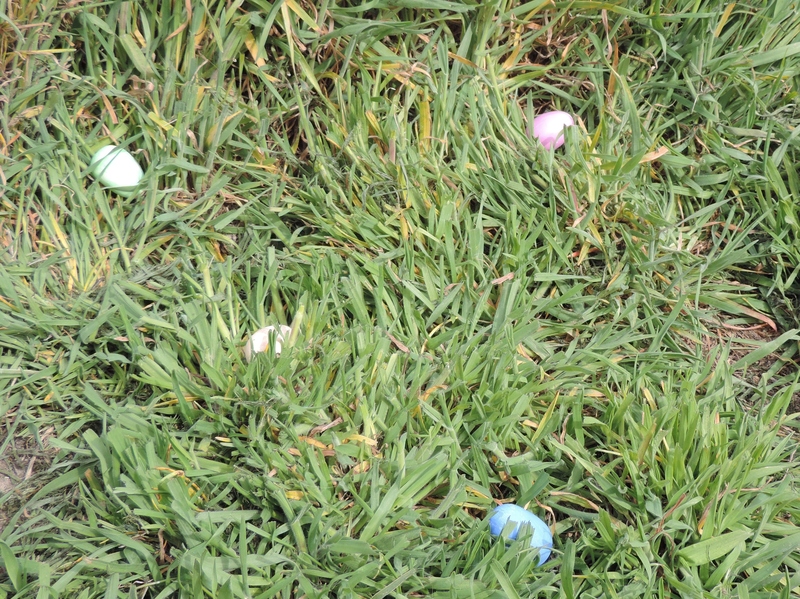 Easter eggs! 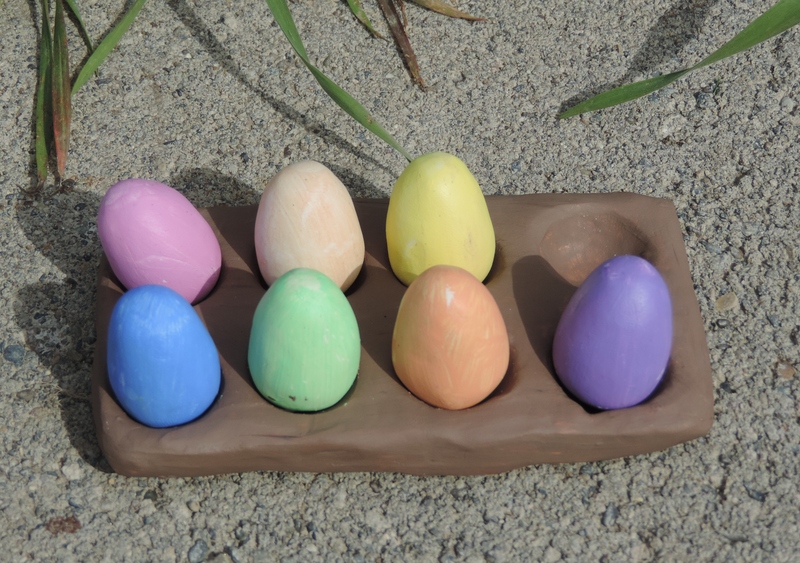 I used white Sculpey Polymer Clay to make these eggs. 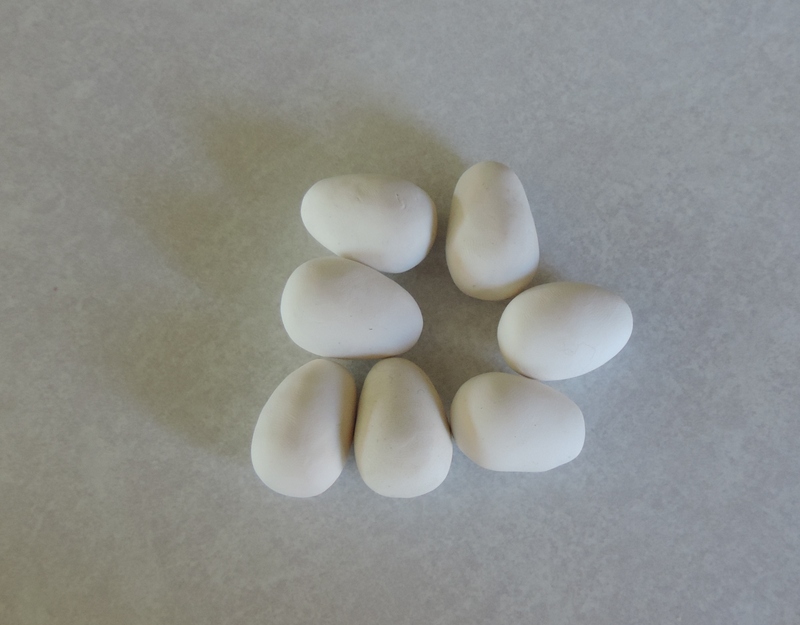 First I rolled a some clay into a small ball. 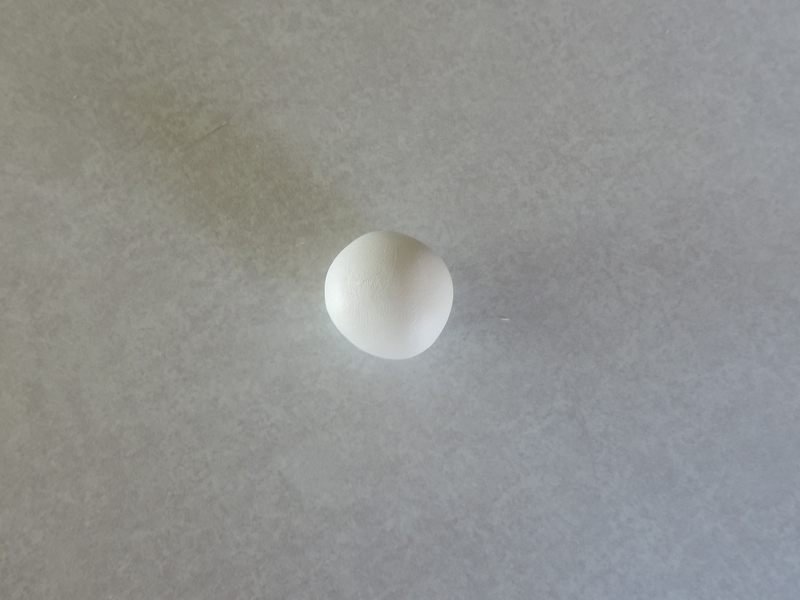 I shaped the ball into an egg shape by rolling the circle in my hand, but doing it more on one half of the circle than on the other. I made seven of these and baked them. They took about 45 minutes to bake. 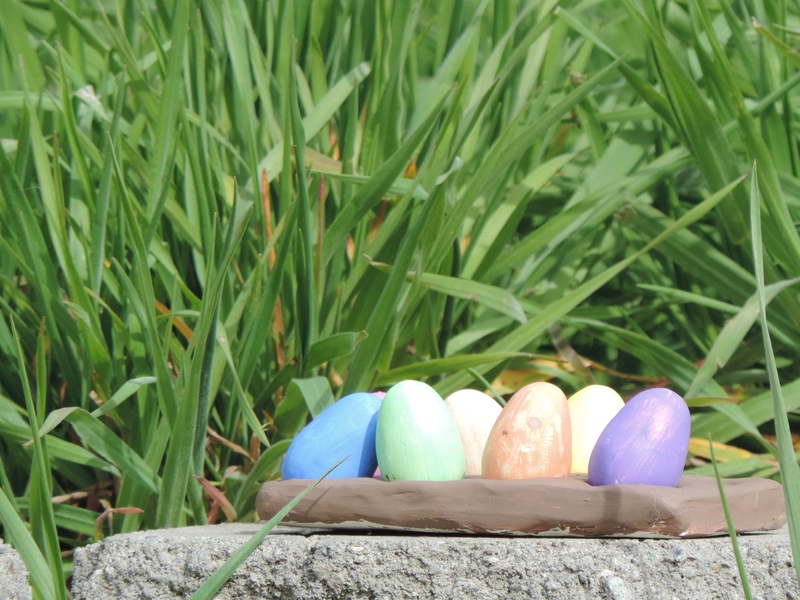 After the eggs were baked, I used them to make the holder. I formed the clay into a rectangle, about 3/8 of an inch thick. 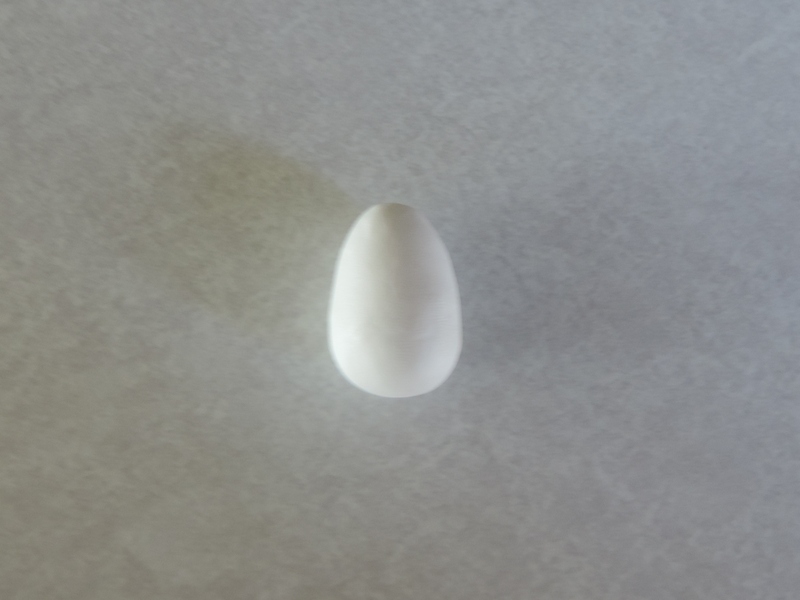 I placed the egg on the rectangle and squished it down. I did this eight times. 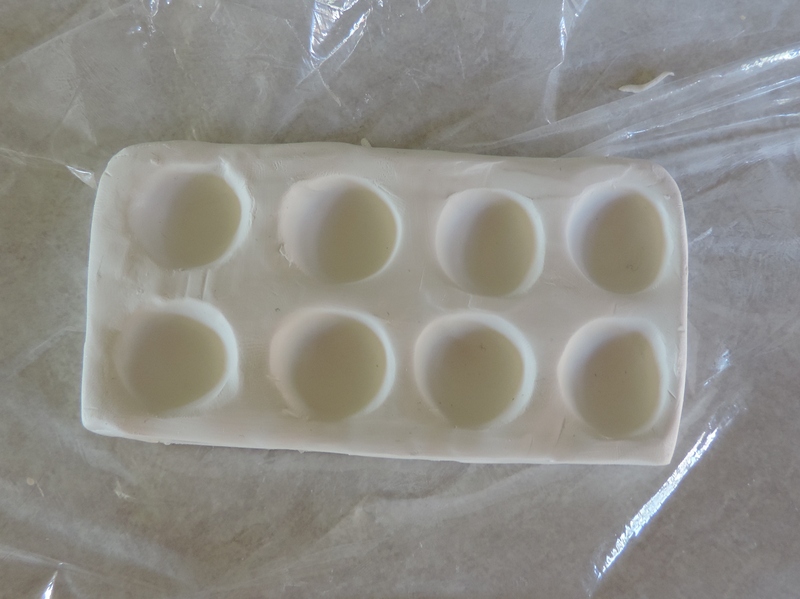 Squishing the clay around with the eggs distorted the original rectangle, so before I baked the holder I smoothed everything out and corrected the edges. The holder took about an hour to bake. 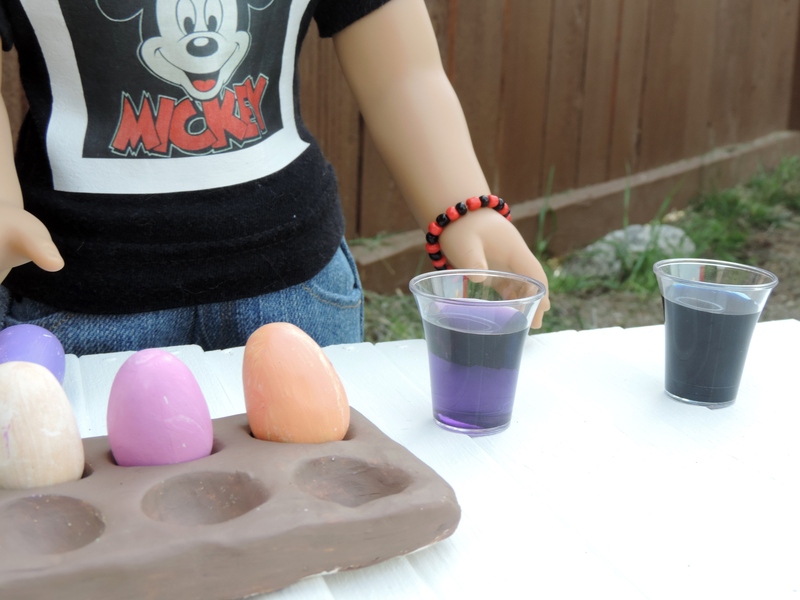 Once everything was baked, I mixed together some acrylic paint and painted the eggs each a different color. I painted the holder brown. Size comparison! 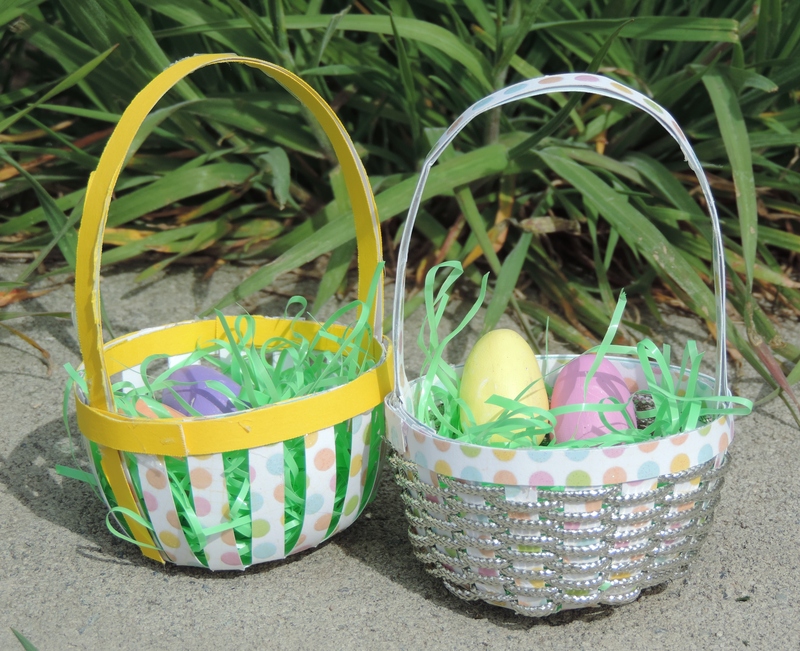 Now the Easter baskets have colored eggs in them! 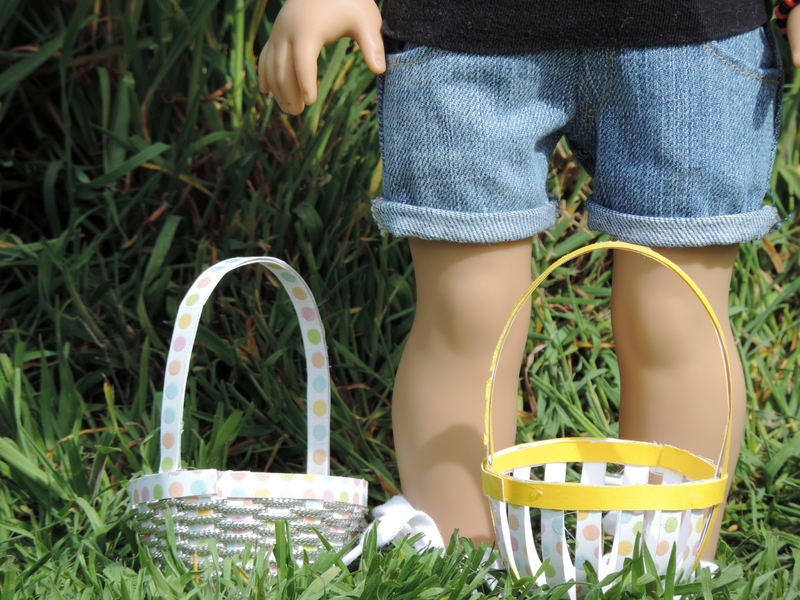 Since Easter is soon, I made some doll sized Easter baskets. 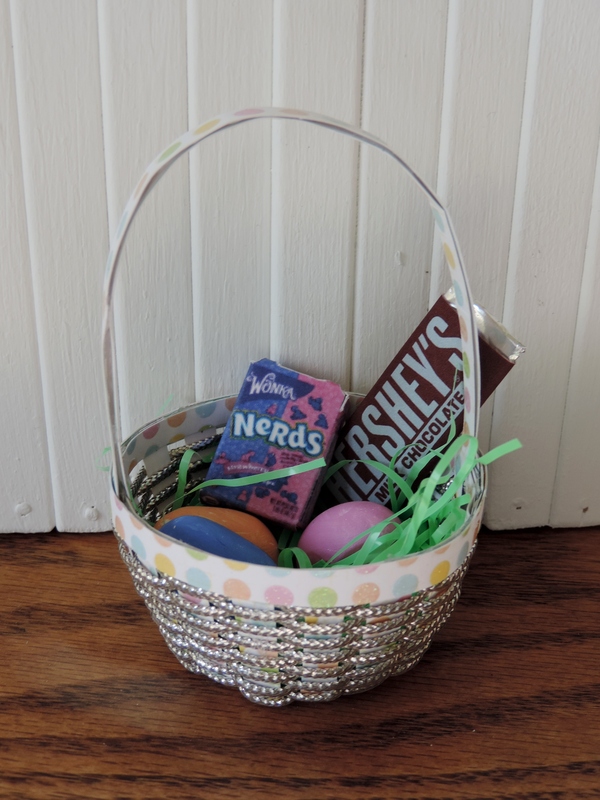 This week leading up to Easter I plan on posting cute and fun things I have made to fill the basket with goodies! 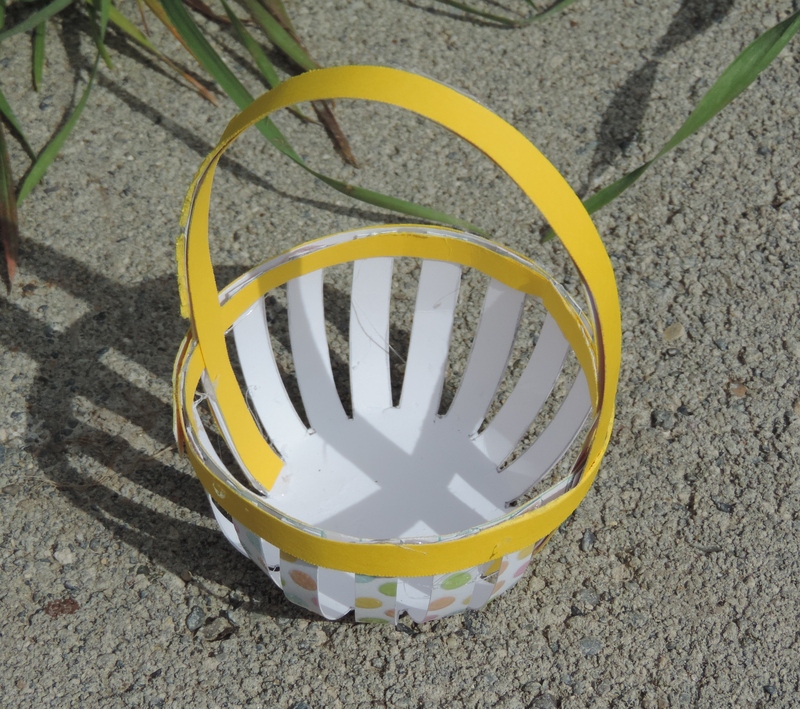 In their latest newsletter, Lee & Pearl included a tutorial on how to make a doll sized Easter basket out of card stock. Here is where you can find it. 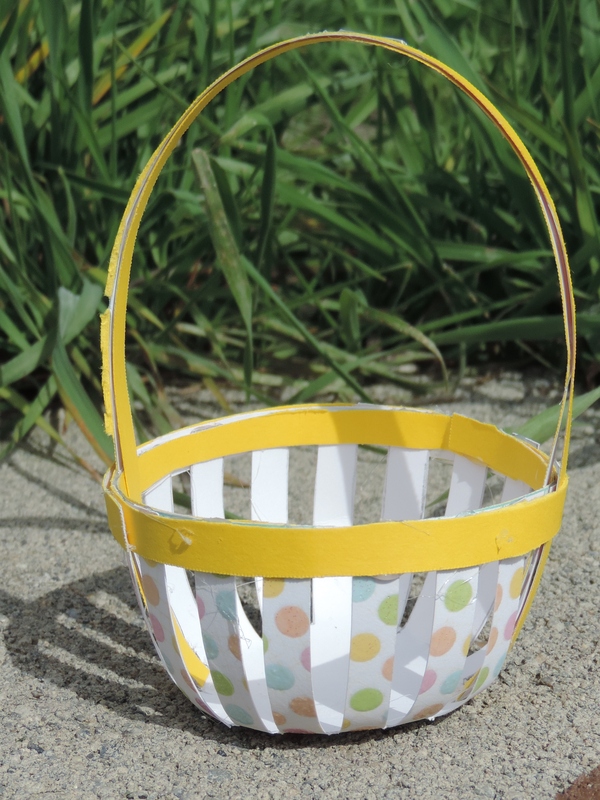 The basic directions require card stock, double sided tape and ribbon. 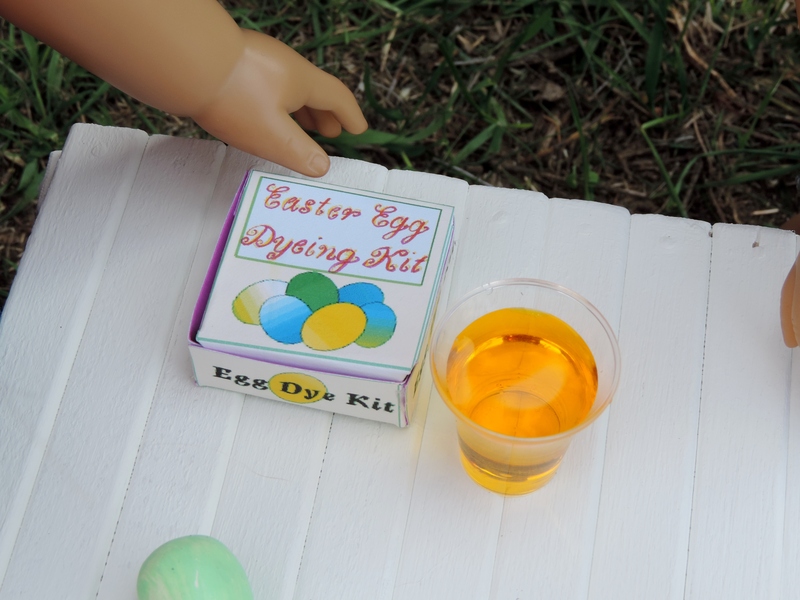 They have examples, however, of other supplies used such as embroidery floss. For my versions, the first one I made using card stock, hot glue, and gift wrap cord. The second one is without the woven part. The handles are sturdy, as mine have two layers of card stock and two of normal printing paper. They were fairly easy to assemble. They are the perfect size for doll hands! This dress was made from an altered version of this dress pattern for free here. It is designed as a one-strap dress, but to make a two sleeved version of it, I cut the fabric on a fold with the center of the pattern on the fold, so when I am done I have two straps! I didn’t use a pattern for the skirt. 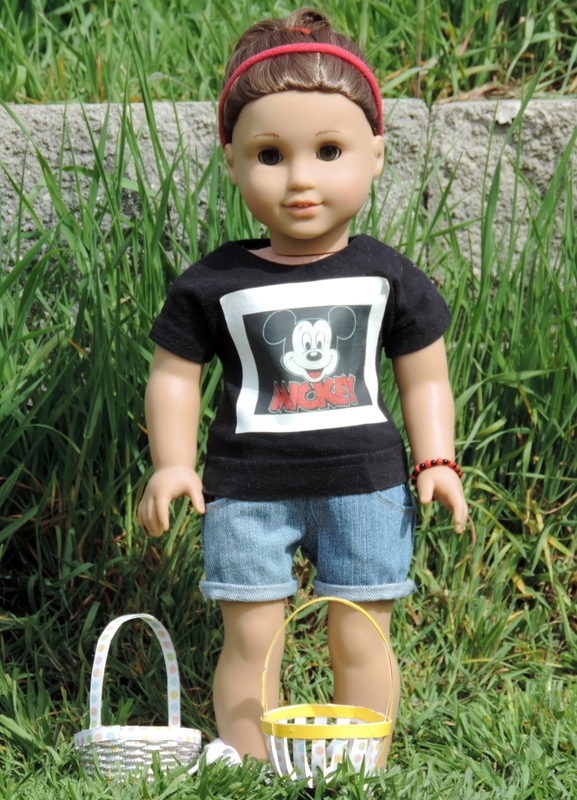 For some reason almost every time I make a dress for my Kidz n Cats doll, I don’t have enough fabric to make the skirt as long as I would like. I was already planning on overlaying the plain cornflower blue cotton with the blue chiffon. When I realized the cotton would be shorter than planned, I made the chiffon overlay longer to make the dress more appropriate. The result isn’t quite ideal, but that’s okay. Both fabrics I got from the remnant section of the fabric stores I shop at. The bodice is self-lined with white cotton. 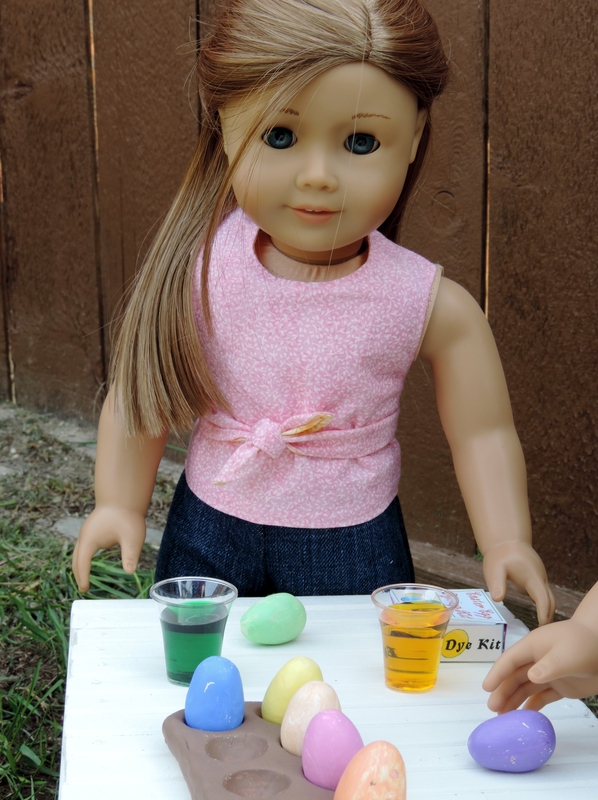 Also, this shade of blue isn’t exactly an Easter blue, but it matches her eyes well. 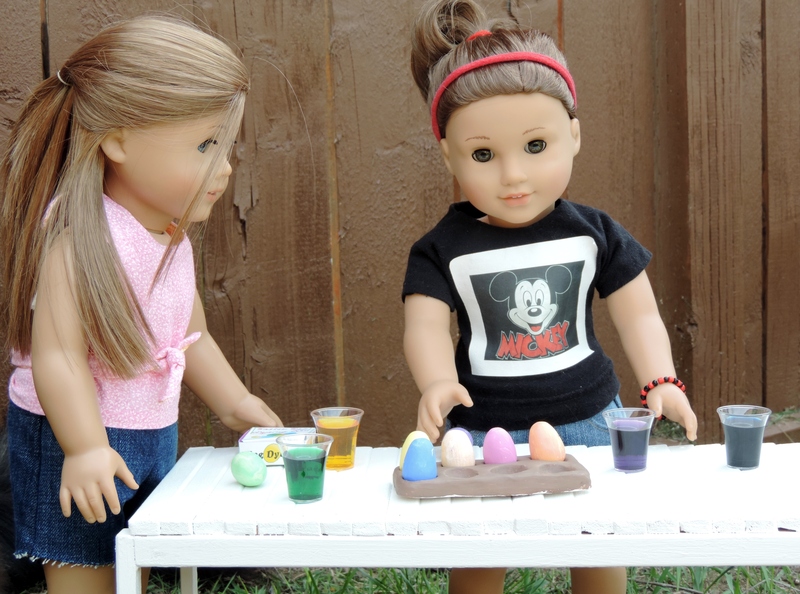 Now all three of my girl dolls have Easter dresses. Planning ahead! 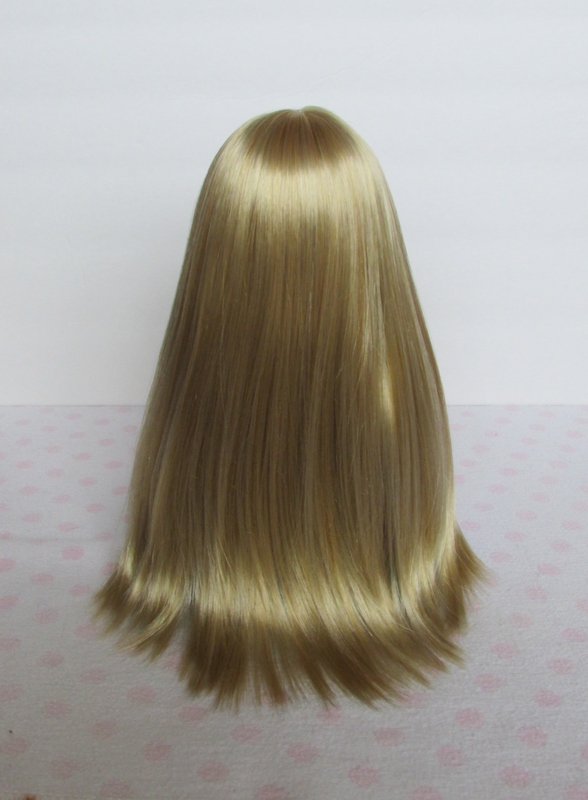 When she’s sitting, she can completely hide behind her long golden hair.